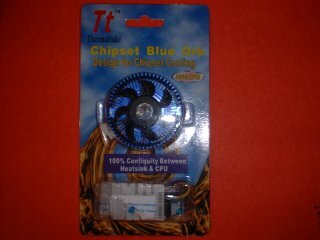 The Blue Orb by ThermalTake is the answer to everyone's search for a chipset cooler that works and is cost effective. Sporting a nice blue color, it adds definite color variety inside your box. 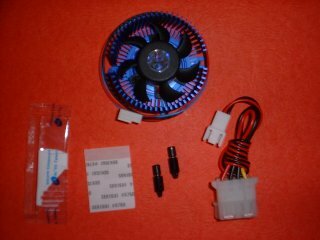 In addition to the blue round Aluminum 6030 heatsink, it also has a custom 43mm fan that pushes 15cfms at 26dB. Running out of the fan is a three pin connector that provides fan RPM monitoring, a very nice feature. 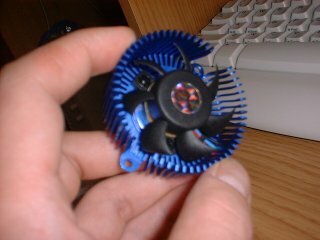 The blue orb is made specifically to fit all Geforce's and Voodoo3 based video cards. For all other cards, a thermal adhesive tape is included so it can be applied to the chipset. We would like to thank SubzeroPC for providing us with a test sample of the blue orb. If you need any type of cooling supplies, these are the guys to go to! Go there and grab your Blue Orb at an incredible price! While reading the back of the package, it says starting voltage at 7.0v DC. Which means this can definitely be hooked up to a fan/bay bus to control fan speeds! Nice info for the person who wants to minimize the noise coming out of his or her computer. Included in the package is the Blue Orb Chipset Cooler, 3pin => Molex (4pin) extender), thermal tape, video card push pins and silicone white thermal compound. Enough extras to get this cooler on almost any type of chipset.